With the recent eldar release I figured it'd be cool to put up a thread with Eldar Cosplay pictures. If these Eldar Cosplay owners see their costumes here feel free to pop in and share your design processes. Nice. 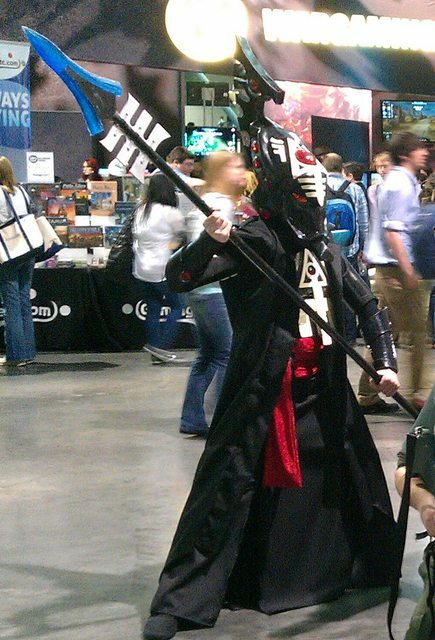 My brother was just at A-Kon in Dallas this past weekend and he got a few pictures of a commissar and a space marine. Pretty cool looking. Anyway, I'm with gothic, the first one looks like the best. The gun and helmet in the third picture are pretty good, although they do look very plastiky. The first one does look very good. Am I crazy if I say I thought Jez was saying he was starting an Eldar Cosplay when I first read that thread title? Yes I think your crazy Jaco. Jez is way to sweary to be an Eldar! I'll give them big props for trying to represent the Eldar on the cosplay scene, but I'm hoping to do better with my own creation (eventually!). Hah, so I'm not the only one. I like them all, but the mask of the first is simply incredible.